HAPPY NEW YEAR FROM THE LIBERTY ONE! I just thought I'd share with you pictures of a custom Liberty -1 space craft model! 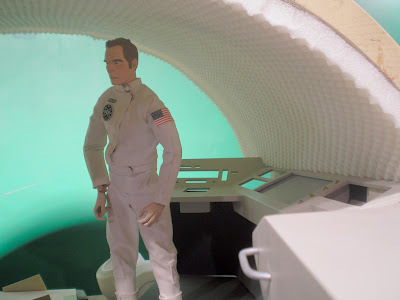 It is a 1/6th scale project that Apes fan Chris Hight has commissioned fellow fan Matt Sotis to work on. Matt has been recreating the ship for use with the Sideshow 12 inch Figures, based on the actual set blueprints. Check out the amazing pics below! Obviously this is still a work in progress, but its looking fantastic. In time, Matt hopes to complete the Liberty - but what he doesn't know yet might kill him! As you know, The Liberty-1 (formerly the Icarus) is somewhat of an enigma - with only its command module sticking out of Dead Lake in the beginning of the original Planet of the Apes - and while there are several theories online as to the design of the the rest of the ship, it has not been officially revealed... until now. 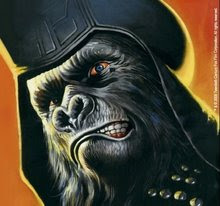 In Conspiracy of the Planet of the Apes, we will be showing for the first time ever, the official design of the REST of the Liberty starship, as conceptionalized by myself and an influential film designer whose name will be revealed in time! Suffice to say, the portion of Liberty - 1 we do see in the film is just the tip of the iceberg - there is much more to the vessel that propelled Taylor, Landon and the rest of the crew to the future, and their final fates.